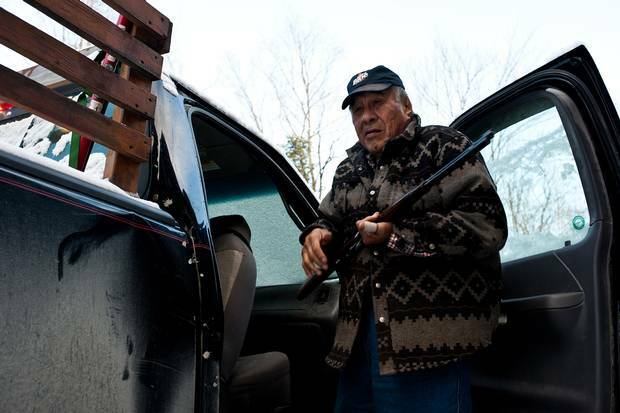 Raymond Owl, a First Nations elder and environmental activist, handles his hunting rifle in Sagamok Anishnawbek First Nation on Nov. 21, 2016. His organization, Traditional Ecological Knowledge Elders Group, wants an herbicide banned in traditional First Nations territory. 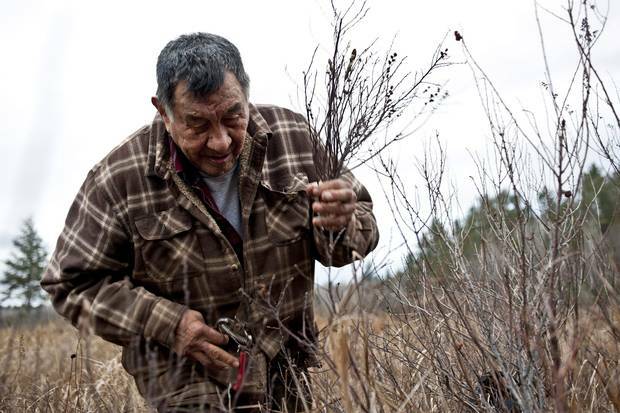 When Raymond Owl hunts and forages for medicines in woodlands around his Northern Ontario First Nation, he routinely finds blistering, withered plants and seldom sees game. The forest is part of a tract of land sprayed with glyphosate, the active ingredient in an herbicide used to expedite the growth of coniferous trees after clear-cutting. And Mr. Owl argues the effects of the chemical impede traditions on which his culture hinges. "You don't want to take a chance on it," he said. "If you go up the road here where they sprayed, everything is black, like a forest fire." Not only does the forest near Sagamok Anishnawbek First Nation – about an hour's drive southwest of Sudbury – yield fewer fruits, he said, but his people are reluctant to take from the bush in case the flora and fauna are contaminated. Mr. Owl refuses to harvest in these affected areas; and for roughly two decades, he's noticed marked changes to the environment. "If the forests weren't sprayed, we would harvest as we please without any fear." Mr. Owl, 73, co-founded an organization called the Traditional Ecological Knowledge Elders Group (TEK) to protect a large swath of forest along the northern shore of Lake Huron between Sault Ste. Marie and Sudbury that totals about 5.1 million hectares. TEK says glyphosate is harming their traditional territories, ways of life and consequently infringing upon their vested rights as First Nation people. After two years of sending letters to provincial and federal officials, TEK organized a peaceful demonstration of about 50 First Nation elders and activists on Parliament Hill. They held placards emphasizing their discontent with what they consider a "poison." They want the department to abolish the use of glyphosate in their territories. TEK has been pressing Health Canada and the Ontario's Ministry of Natural Resources and Forestry (MNRF) for a moratorium. But the group has made little headway. Calls placed to forestry and helicopter companies in early September revealed that glyphosate was used in the area during the spraying season. And MNRF said it was considering the moratorium request, but never followed up with a timely decision after telling The Globe and Mail it would. Glyphosate was designed by Monsanto in the early 1970s and is the most widely sold herbicide in Canada. The agent is deployed by air over portions of Ontario forests to eliminate unwanted plants – like underbrush – from stifling the early growth of coniferous trees, which are harvested for commercial use. And it is quite effective. 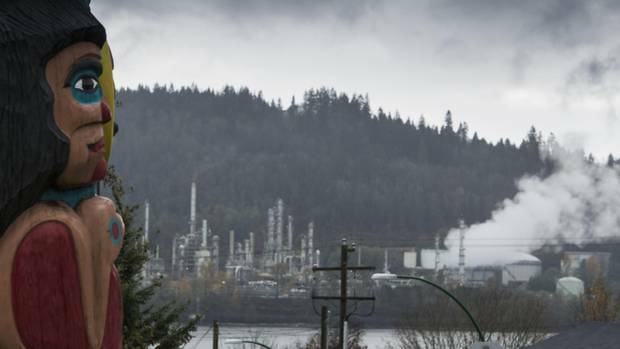 That's because it's systemic (it impacts the entire plant), said Paleah Black Moher, head of environmental exposures at CAREX Canada, a surveillance project studying exposures to known and suspected carcinogens in the country. "How it works is essentially stopping the enzyme that is responsible for producing amino acids, which are the basic building blocks of growth. It essentially hinders growth. It will eventually kill the plant," she said. International health organizations have given glyphosate mixed safety reviews. This year, the UN Food and Agriculture Organization and the World Health Organization said in a joint review that it is "unlikely" to be a cancer-causing agent. In 2015, however, the WHO's International Agency for Cancer Research said it's "probably carcinogenic to humans" after going through studies of agricultural exposures since 2001. In Canada, the Pest Management Regulatory Agency (PMRA), a branch of Health Canada responsible for approving the use of a given pesticide or herbicide, determined after reviewing scientific studies that "products containing glyphosate do not present unacceptable risks to human health or the environment when used according to the proposed label instructions." The herbicide is treated differently from province to province. Quebec, for example, banned the use of the substance in public forests in 2001. In Ontario, glyphosate is used, but is sprayed on less than 0.2 per cent of the 28 million hectares of managed Ontario Crown forests (48,655 hectares in total – a land mass greater than Montreal), said Michael Irvine, a vegetation-management specialist with the MNRF. Part of traditional Anishinabek territory is included in aerial spraying programs. Decisions to deploy glyphosate are related to site characteristics, said Jolanta Kowalski, a senior MNRF media-relations officer. "Temperature needs to be between 5 and 21 degrees. The relative humidity has to be greater than 50 per cent and winds need to be less than 8 kilometres an hour. There are 60-120-metre buffer zones for aerial applications left on all creeks and streams that are within or beside the spray blocks." Mr. Irvine calls TEK's concerns a "misconception." "It's used following tree-planting operations to ensure that the seedlings that are planted survive and grow," he said. 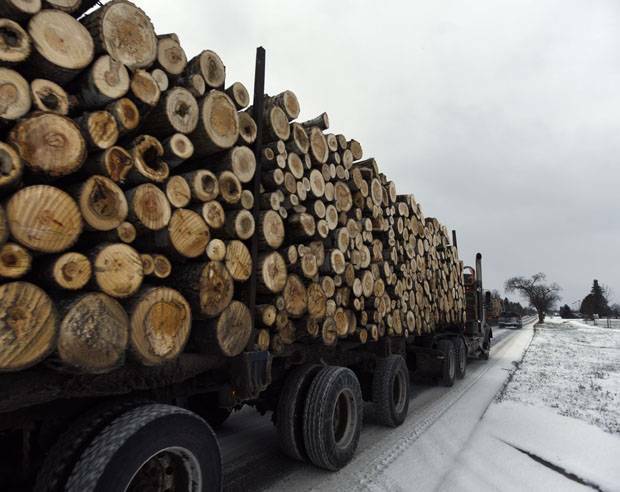 "Our interest is in renewing a forest that's comparable to the forest that was harvested." Glyphosate's half-life – a measure of how long a compound remains in soil and water – depends on conditions, he said. "If conditions are warm, moist and aerobic, then it breaks down really quickly – maybe a week or less." The longest period has been more than 100 days in dry conditions, he added. According to CAREX Canada, glyphosate can remain in the soil for 47 days on average. And because it dissipates, forests eventually regain their biodiversity, said Mr. Irvine. "It may take several years," he said. "But all the species [like deciduous trees and varieties of undergrowth] that were represented on that site before application will come back." But the linchpin of TEK's fight goes beyond any scientific review of the herbicide. It says the use of glyphosate is an infringement of indigenous rights enshrined in the Robinson-Huron Treaty of 1850. 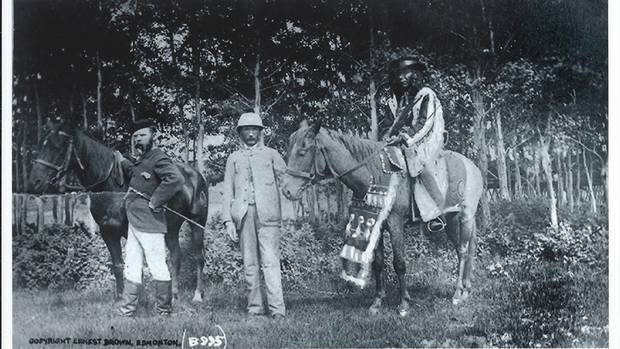 The treaty states that the Crown promises "…to allow the said Chiefs and their Tribes the full and free privilege to hunt over the Territory now ceded by them, and to fish in the water thereof, as they have heretofore been in the habit of doing." A letter written by TEK to provincial and federal departments on Sept. 15 calling for a moratorium says the spraying of herbicides violates these rights. "Herbicides destroy the interdependent balance of all life, which is the core philosophy of the Anishinabek," says the letter. "We do not want to collect medicines from our lands that might have been affected, hunt animals that consumed plants that have been poisoned, nor do we want to fish in water that have been contaminated by herbicides." Stephen O'Neill, who spent 16 years as a judge for a superior court in northeast Ontario before retiring, is providing TEK with legal counsel and says the decision to use glyphosate has been unilateral because the group has not been adequately consulted. "In an ideal world, [consultation] would mean sincere attempts to understand each other's position and engage in good-faith processes of communication," said Mr. O'Neill. "It's not a one-way street. "TEK is saying you have to be involved through the process of consultation and accommodation with respect to treaty rights and impacts of this government action on those rights." Legal action could be on the horizon, he added, depending on what Ottawa and Ontario choose to do with TEK's requests. In the Sept. 15 letter, it gave the federal and provincial governments a deadline of Sept. 30 to arrange a meeting. "We [still] haven't heard a thing," said Mr. Owl. If First Nations people want to be consulted, it's up to the province, said a Health Canada spokesperson, who didn't want to be identified. But TEK has persistently addressed letters to Ottawa in hopes Health Canada will implement a ban of glyphosate in its territory. Dr. Philpott said in a July 4 letter to the Member of Parliament in the area, NDP MP Carol Hughes, that TEK's concerns are being "carefully considered" and Health Canada's PMRA will arrange a conference call. TEK shut down the offer. "We don't want no teleconference," said Mr. Owl. "We [the elders] want to know who you are and look at you. Oral communication and seeing is the makeup of First Nations. It's not to complain, it's for them to hear what's happening in our territory." ‘If the forests weren’t sprayed, we would harvest as we please without any fear,’ Raymond Owl says. Some communication between TEK and the province has occurred, though. On July 12, Wayne Fiset, MNRF district manager from Sault Ste. Marie, sent a letter to Willie Pine, co-leader of TEK, notifying the group of imminent herbicide spraying in the region. 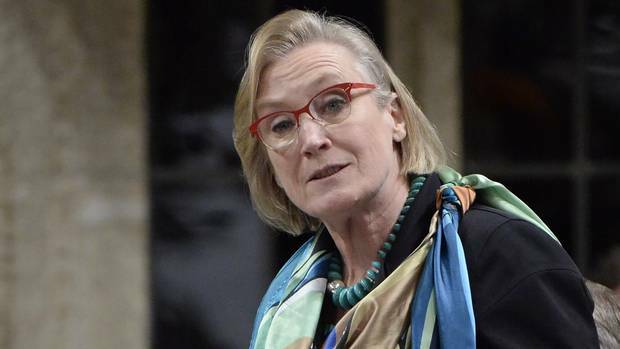 The ministry also acknowledged indigenous rights, saying in an e-mail: "Ontario is committed to respecting existing Aboriginal and Treaty rights and to meeting the province's constitutional and other obligations in respect of Aboriginal peoples, including the duty to consult. Ministry officials continue to meet with First Nations to discuss forestry issues, including aerial spraying." One such meeting occurred on July 27. It was on this date that TEK requested a suspension of the herbicide. The following day, Patrick Wedaseh Madahbee, the Grand Council Chief of the Anishinabek Nation-Union of Ontario Indians – which represents 40 First Nations in Ontario – also called for a moratorium. "The elders are getting very concerned. We've been trying to give this message to federal and provincial [governments] and they keep coming back and saying the toxins in this stuff is at acceptable levels," said Chief Wedaseh Madahbee. "They're not the ones that are eating from and living in the environment. The people on that land have lived there for years, and they've seen a difference as a result of spraying." In terms of federal government efforts to consult with TEK, Jason Flint, director of the PMRA, offered the elders a chance to meet with an advisory council next February. "It's an opportunity to get across what [TEK's] concerns are about these pesticides," said André Gagnon, a Health Canada media-relations officer. Mr. Owl, though, is adamant. "Advisory don't mean they'll listen to me," he said. "They haven't listened to us yet. "The bottom line is to stop aerial spraying. If it destroys anything, grass, leaves, we're against it." B.C. projects create testing ground for UN declaration on indigenous rights B.C. warns UNDRIP could put jobs and the economy at risk if First Nations stop projects like the Trans Mountain pipeline expansion, Justine Hunter reports. Editorial: Back to the land, as indigenous owners The indigenous peoples of Canada are very likely to be happier and more prosperous if they have lands and other resources of their own, rather than being dependents, ad infinitum. Showdown over water looms for Alberta reserves The province and several First Nations appear headed for a showdown over who controls water on aboriginal lands, one that risks leaving some reserves without water during droughts, Matthew McClearn reports.